The fresh appearance. 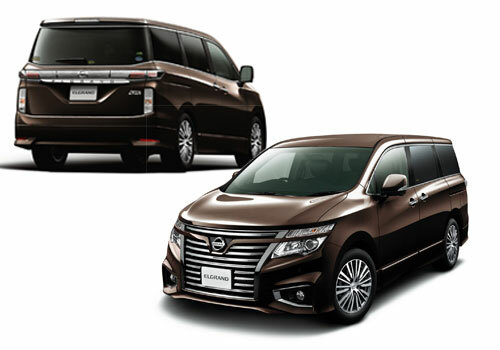 New Nissan Elgrand spoils all eyes with significant changes in exterior design. The fresh appearance of the New Nissan Elgrand captures the essence of Nissan Z sport car from the lines of the tough and sporty front grille to the rear with the unique rounded curves, which outlines an unprecedented dynamism in shifting the future. Proportions Emphasize. The low and wide body proportions emphasize the New Nissan Elgrand’s stability, with the dynamic lines flowing from the front and leading all the way down the sides, highlighting its powerful profile. Each pillar is blacked-out, adding to the look of strength and solidity. New 18' Alloy Wheel. Chrome-coated, polished aluminum-alloy wheels complete the luxurious and appealing appearance. Dual Panel Sunroof. The twin sunroofs allow fresh air and sunlight into the cabin while cruising in good weather. Twin Sliding Doors. The "Twin Sliding Doors" with Auto Closure (sliding doors and back door) design with the world’s first function utilized on the New Nissan Elgrand - the one touch switch system that not only locks/unlocks the doors, but also automatically closes/opens the One-Touch Auto Slide Door without pulling the door handle. A remote-controlled back door. Which is controlled by either the back door switch, the driver’s seat or from the Keyless Go’s remote control. Zone Body. Nissan’s unique high-strength Zone Body helps dissipate the crash energy to mitigate the impact to the occupant. SRS & Curtain Airbags. 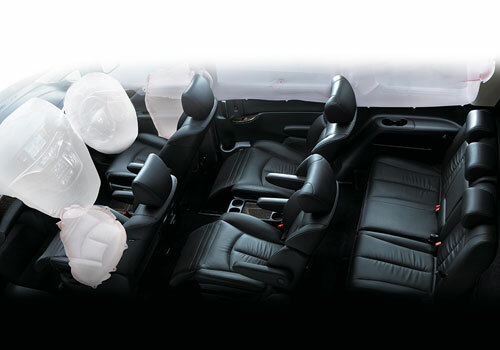 The high strength cabin offers greater protection in frontal and side impacts (including the front, side and curtain airbags), while the front of the vehicle incorporates many impact absorption features effectively reduce injury to driver and passengers’ head and upper torso during frontal collision. Vehicle Dynamic Control (VDC). System activates engine and brake control when necessary to help stabilize the vehicle on slippery roads and during emergency maneuvers. QR25DE Engine. 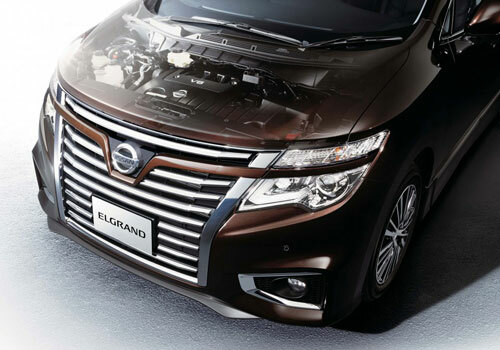 The New Nissan Elgrand is equipped with a 2.5L QR25DE engine, providing responsive acceleration from low speeds, and high torque giving the vehicle a quick response and a strong driving feel. Xtronic CVT-M6. Seamless acceleration with less vibration and noise for the real smooth riding experience performance. Advanced Xtronic CVT-M6 with 6-speed manual +/- mode maximizes performance and fuel economy. Adaptive Shift Control system to provide an optimized driving condition, combining superior driving performance and fuel efficiency. Environmental Friendly. Front engine with front wheel drive generates more power and spurs your raw desire to drive. In addition, it can lower the fuel consumption that can be more environmental friendly. Stability and Ride Comfort. 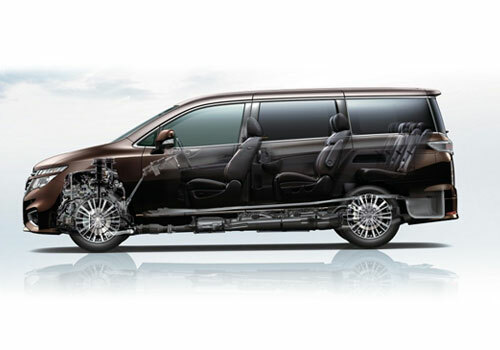 Both the newly designed front and rear suspension utilize aluminum links and lower load springs that are lighter than the previous Nissan Elgrand design. 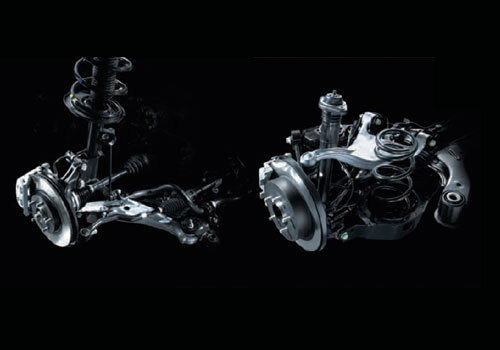 The rear multi-link suspension assists in providing both superior driving stability and ride comfort. Ventilated Disc. 4-wheel ventilated disc brakes extend driving control by enhancing brake effectiveness. Magnificence. Equipped with excellent amenities, the spacious cabin ensures the highest degree of versatility and comfort possible. Rejoice in the magnificence and enjoyment when travelling deluxe in New Nissan Elgrand!. Conveniently. 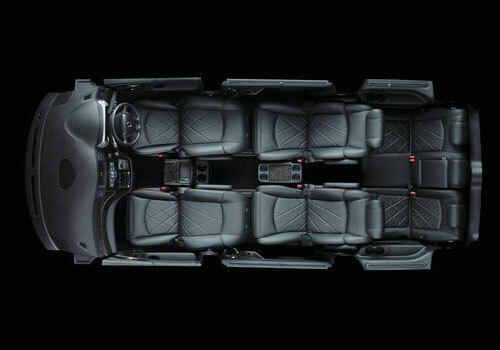 New Nissan Elgrand's optimally designed foldable 3rd row seat can be easily stored, while also providing superior passenger fit and accommodation compared with similar MPVs. Conveniently installed in the luggage compartment is the switch that folds the 3rd row seat by simply pressing it. This switch can also control the seatback to return to its original position.